I couldnt NOT post the pic this big cause it was that good. 2 Jalapeno’s seeded and sliced into very thin coins. Grab dem scallops and trim off the little white abductor muscle, you dont want this, its chewy. In a small bowl, mix the lime juice and tequila then add the scallops and let sit for one hour. 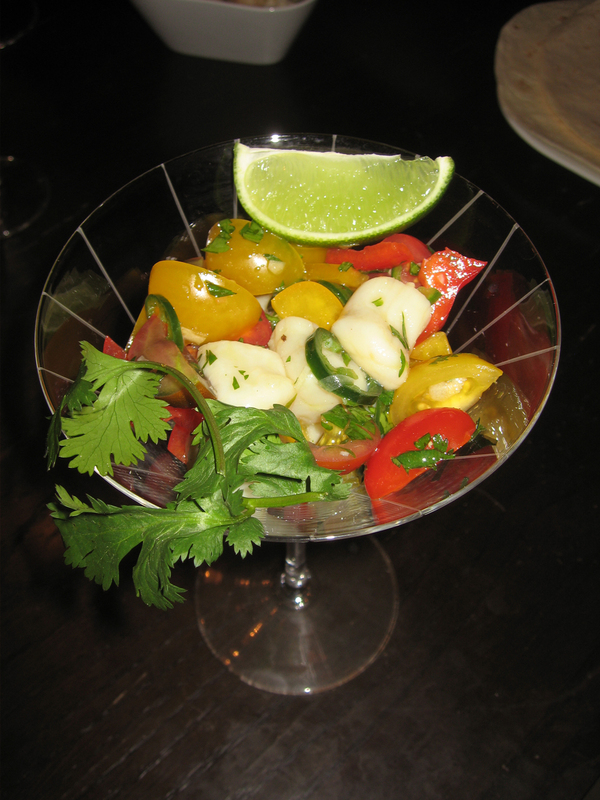 Add the olive oil, garlic, chopped cilantro, jalapeno’s, bell peppers, tomatoes, and green onions to the scallop mixture. Season with salt and pepper then mix well. Its ready for serving. I served it in some martini glasses and it really shines it on. I’ve also seen them served on their own half shell. Quick, easy, no cooking, just some chopping and impressive. How’s the taste? Amazing. Its so fresh and the little bits of pepper, cilantro, and garlic really work great together. The scallops themselves providing you get them fresh melt in your mouth. Its that good.